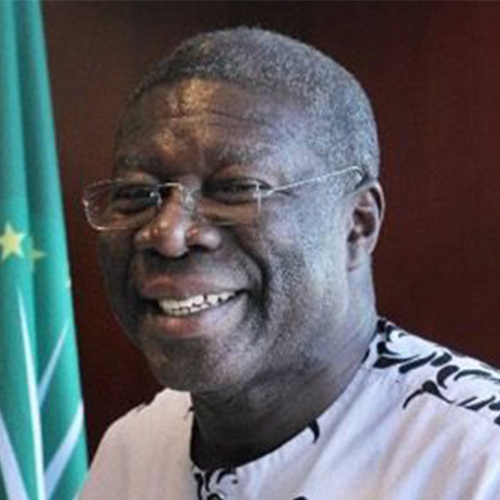 Ambassador Kwesi Quartey, the third Deputy Chairperson of the African Union Commission since March 2017, manages the Commission’s key administrative and financial portfolios to ensure operational efficiency of the Union. His strategic focus is to ensure that the operational systems are fully functional and aligned to enhance the institutional capacity of the Commission, organs, liaison offices and specialized agencies. This will help build the strong foundation needed to drive and coordinate the vision of the Union – an integrated, prosperous, democratic, peaceful and united Africa at peace with itself and the world. Elected by the African Union Executive Council and appointed by the Assembly of Heads of State and Government of the 55 member states in January 2017, the Deputy Chairperson’s core mandate includes standing in for the Chairperson in his absence. Mr. Kwesi Quartey is a lawyer by training. He has over thirty-five years of experience as a career diplomat. He is particularly keen on empowering people to unleash their ingrained creativity at work. He is passionate about education and the promotion of human capital through skills improvement as the critical vehicle to achieve the “Africa We Want”. His dream is to have every African child in school before 2020. He believes this will enable Africa to harness its demographic bulge into quality skills to create human capital. Without a numerate and literate Africa, Africa will not be able to own the 21st century or find its way in the knowledge-driven globalized economy. Prior to his appointment, Ambassador Quartey was Secretary to H.E. Mr. John Dramani Mahama, President of the Republic of Ghana from 2015. In 2012, he was Ghana’s Deputy Minister of Foreign Affairs and Regional Integration, where he was involved in the coordination and management of Ghana’s Foreign Policy. Between 1980 and 2001, Amb. Quartey served in various capacities in Ghana’s Embassies and High Commissions in Cotonou, Cairo, Brussels, Havana, New York and London, during which he played a key role in promoting multilateralism and enhancing the political and economic relations of Ghana within the comity of nations. During his tour of duty in Brussels, he helped to steer financial and economic negotiations with the European Commission and the European Investment Bank. In 2001 and 2004, he served as Ghana’s Deputy Permanent Representative to the United Nations in New York. He represented Ghana on the International Law Committee (6th Committee) of the General Assembly and the International Law Commission. He was Deputy High Commissioner at the Court of St. James, London, from 2007 until October 2008, when he was appointed Ghana’s Ambassador to Ethiopia and Permanent Representative to the African Union. During the period, he chaired the Advisory Sub-Committee on Administrative, Budgetary and Financial Matters, and helped draft the Commission’s Staff Rules and Regulations. Mr. Quartey served for many years as Director of the Legal and Consular Bureau, i.e. Principal Legal Advisor to the Ghana Foreign Ministry. His duties included managing treaties, their ratification, and the advancement of consular relations. Ambassador Quartey graduated LLB (Hons) from the Faculty of Law, University of Ghana. He is a Barrister-at-Law, Solicitor at the Supreme Court of Ghana, and a Notary Public. Mr. Kwesi Quartey is married to Mrs. Audrey Quartey. They have four grown-up daughters. His hobbies include table tennis, chess, tennis, and field hockey where he was a member of the Ghana National Hockey team which won the First African Hockey Championship in Cairo, 1974.